A week that’s (so far) under-delivered: Anything can happen in the space of 24-hours in financial markets. But as we enter the final day of trade in global markets for the week, activity today is shaping up as being just as tepid as that which we’ve experienced in the week’s first four days. It was hoped some new, market-moving information may have been delivered in what was a back-loaded week. Afterall, there was no shortage of event risk. However, thus far, despite a litany of risk events, many of which yielded positive outcomes, market participants have responded to the stories with a shrug. Market fundamentals take priority: Hence, we meander into this Friday having acquired some useful information about the world, but little in market pricing to show for it. 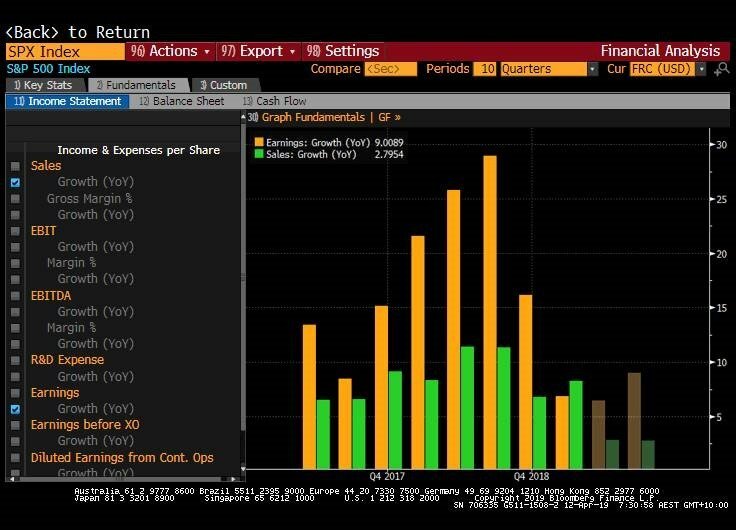 It’s been said before (in fact, it’s been said a lot this week): market participants have developed a singular fixation on upcoming US earnings. And perhaps rightly, and comfortingly so: in a world where markets are dominated, even distorted, by macro-drivers and central bank policy, right now, company fundamentals matter more. It may seem trite to suggest so; however, it would be imprudent to underestimate how overwhelmed fundamentals become in a market dominated experimental monetary policy. Corporate earnings to be a risk barometer: The matter is now, that with Wall Street perched inches away from record highs, and the world’s other major indices well-off their lows, market participants need evidence to justify such a phenomenon. At that, it goes beyond just a micro-level concern of shareholder earnings. With the major risk to global markets the prospect for an uncomfortable economic slow-down, the forward guidance provided by US corporates will be used to form an abstract story for macroeconomic outlook. Market participants know that in the short term, the current state-of-affairs is unfavourable; what the bulls wish to see now is evidence of strength in the long-term. When the micro becomes the macro: A such, the micro-matters become important for macro-watchers, too. Arguably, this week has proven that, in a reversal of the status quo, micro-concerns have superseded those of its overbearing bigger-brother. The state-of-play now is markets have practically discounted fully the 4-and-a-half per cent fall in earnings growth projected by analysts for the quarter. What matters now is how future guidance is modified in response to the commentary and financials put forward by corporates. If that becomes downgraded out of earnings season, too, then Wall Street’s, and global equities big V-shaped recovery may come into question. A faith in the market’s high priests: The bar is still set quite high, with a nearly 7 per cent rebound in earnings on a quarterly basis expected come next quarter. This will come seemingly without a major boost to corporate America’s top line. Much of the rosiness in this outlook is embedded within a hope, however reasonable, that the recent monetary-dovishness and fiscal intervention from some major economic players will reignite global growth. From the Fed’s dovishness, ECB’s return to a completely neutral policy bias, and massive fiscal intervention from China’s government and PBOC, the concerted efforts of policymakers are expected to succeed in turning global growth around. Bonds recalibrating to growth expectations: Market participants are more optimistic that the worst of the turbulence experienced in the global economy in Q1 is behind us. That’s being revealed in a recalibrating in global bond markets, in response to some reasonable economic data. 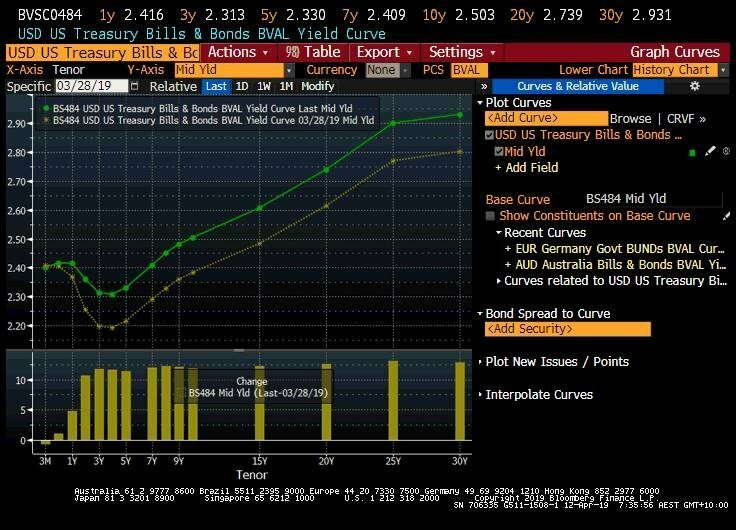 US Treasury yields are lifting across the curve, following the face-ripping rally in bond markets only a fortnight ago, in response to a tempering of expectations of monetary policy easing by the US Federal Reserve. Though the next move from the Fed is expected to be a cut, the odds this will happen before the end of the year is now about 50/50. What will the impact be on the ASX? The correlation between the ASX200 and S&P500 isn’t terribly strong. SPI Futures are betraying this today: the S&P closed flat today, but the ASX200 ought to open 21 points higher. The local share-market has traded on its own themes of late, ranging from the oft-cited lift in iron ore prices, and the weakness in bank stocks in response to local property market weakness. Global growth remains a sensitive-point for the ASX, nevertheless, with the chances the bifurcation in Australian and US markets possible enough in the situation that US reporting season surprises to the upside or downside.